Choosing your own type of healthcare is a right everyone is entitled to. Using advance health care directives, you can specify the types of treatment you would like to receive in the future, particularly if you become too ill to communicate with doctors and loved ones. You can also name an agent to make treatment decisions on your behalf. 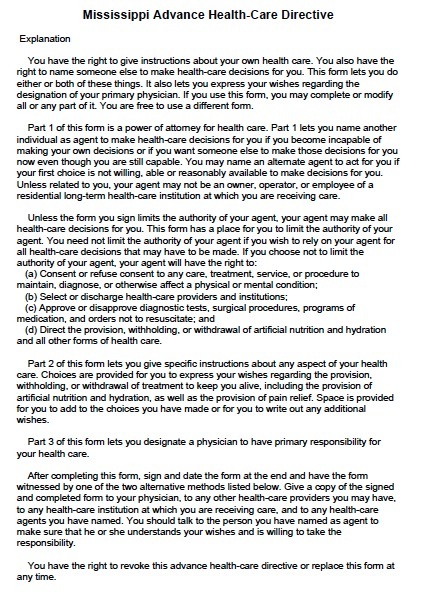 If you do not limit the agent’s authority, he or she will be able to make any healthcare decision for you, including consent to or refusal of any treatment or procedure to affect or diagnose any mental or physical condition, issuing orders not to resuscitate, and withholding or continuing artificial hydration and nutrition. The directive also lets you specifically choose not to receive any life-prolonging treatments if you have an incurable condition that will result in your death in a short time, you are permanently unconscious, or the likely risks of treatment would outweigh the benefits. You may also choose to undergo any life-sustaining treatments indefinitely. In Mississippi, the principal must sign a health care directive, and either two witnesses or a notary public must sign it too, or else it will not be valid.